You may recognize the author's name, as he has sold over 400 million books, however this one was a little bit...different. Dean is known for his dark novels filled with woven themes of intense intrigue. This book however was about his dog, Trixie. Fast forward. The thing about affirmations and daily visualization is that strange things start popping up. This book was one of them. One night before closing for the day, a client of mine stopped by to ask me about financial advice. (note: I am not a financial planner, nor has this topic ever come up between us before) I had just finished, "Smart Women Finish Rich" Hmm. With the topic of books in the air she mentions that she has this memoir by Dean Koontz I must read. I am on this huge self-development kick, but the gesture was kind so I told her to bring it by. The very next day it sat on my desk. Who is Trixie, the whole purpose of this story? A golden retriever. I don't know much about signs but the timing felt right so I quickly added it to the top of my list and spent my Sunday off, today, reading this wonderful book. Trixie was a guide dog for a woman who had her legs removed after an accident. After Trixie had to have surgery on her elbow she declared early retirement and came to live with Mr. Koontz and his wife, Gerda. Not only was she well-behavied, she seemed to be rather emotionally aware and intelligent beyond her breed (or years). The love between the author and their dog was one of true companionship and Trixie shared with Dean deeper meaning to life and living in the moment. She even herself published several books. They spent 9 years with Trixie and just before she passed a neighbor stopped them on their walk to tell Dean that he should know his dog was a very special soul in between perfection and enlightenment. Whoa. 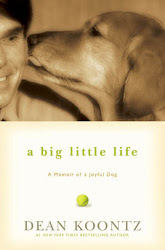 Dog lover or compassionate soul, I highly recommend you read it.